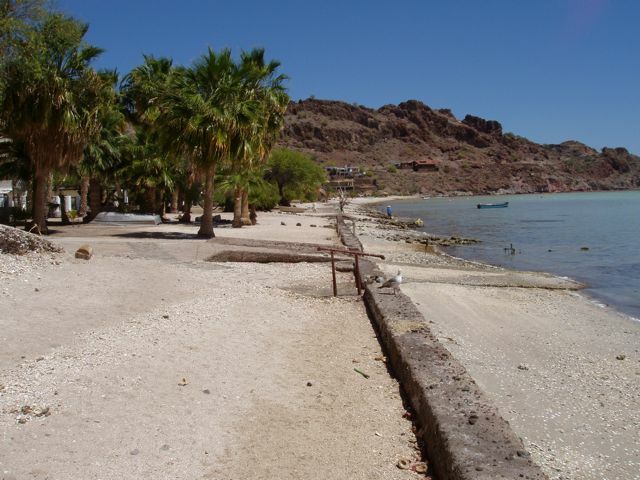 Bahia Conception (Bahia is Spanish for "bay") is a huge and hugely popular bay on the east side of the Baja peninsula. Although shallow, it's as large as Resurrection Bay in Alaska, and it funnels wind the same way. 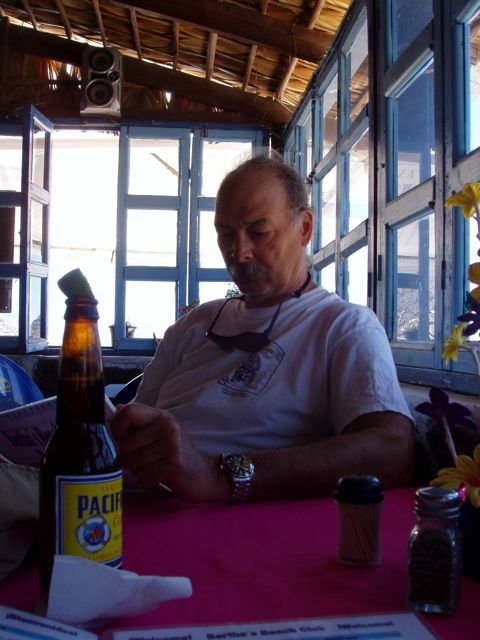 It's popular among cruisers and Mexicans alike and its popularity has caused Gringos and Mexicans to build homes along its shore. 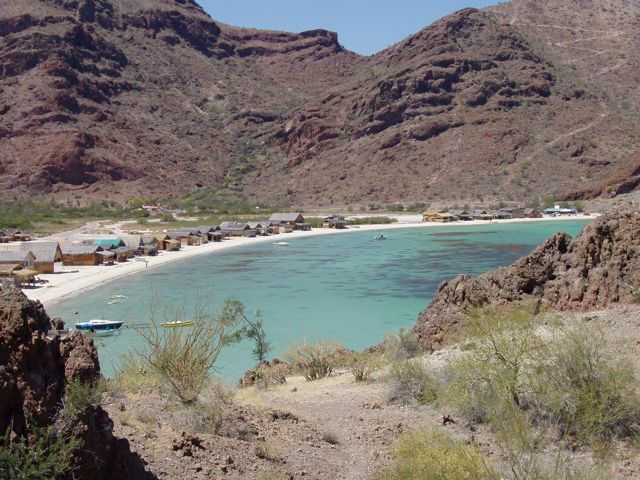 Playa Coyote is a beach, popular among Gringo RV folk and local campers. The locals rent small palapas or erect multiple tents and settle in. They fish, drink, party, and socialize with family and friends. 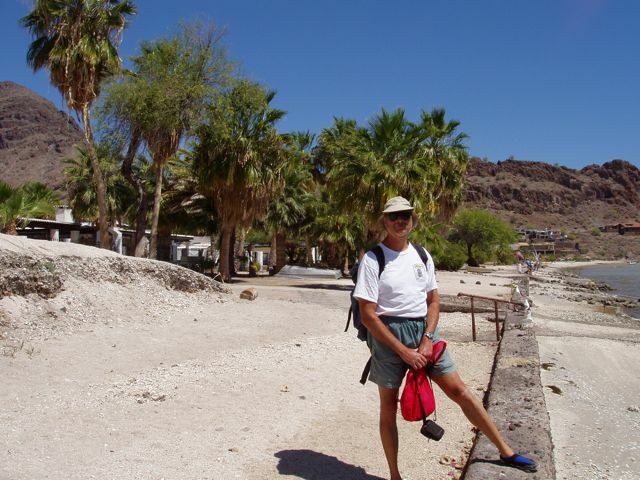 The next beach to the north is Playa El Burro, another popular beach destination since its shallow water warms early. Several small and well-known restaurants and markets serve the area. The small seawall that protects many nice summer homes. None had any power but solar, but the location is so ideal that there were many residents. 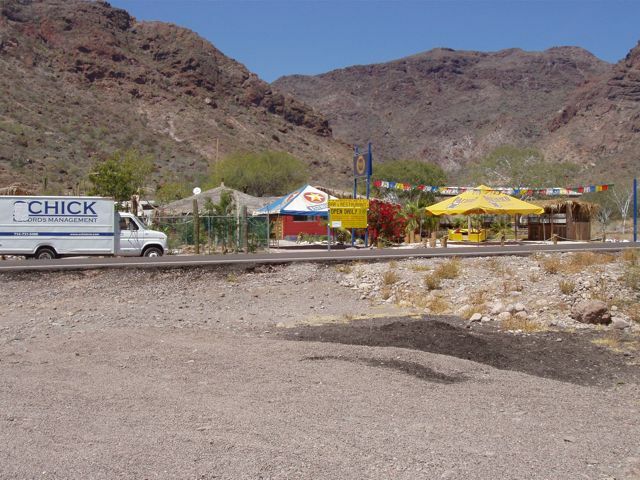 The main Baja highway is about 100 yards from the houses so reaching the area is easy. Lovely Conni walks the sea wall, looking for pretty shells. Ne'er-do-well Gringo caught passing through the neighborhood. 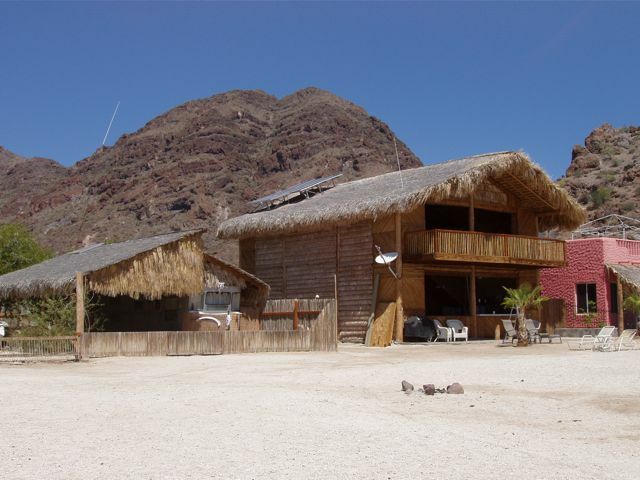 A palapa has been build around an RV at left, in contrast to the larger thatch-roofed residence beside it. Note the solar array on the larger home's roof and satellite antenna in front. 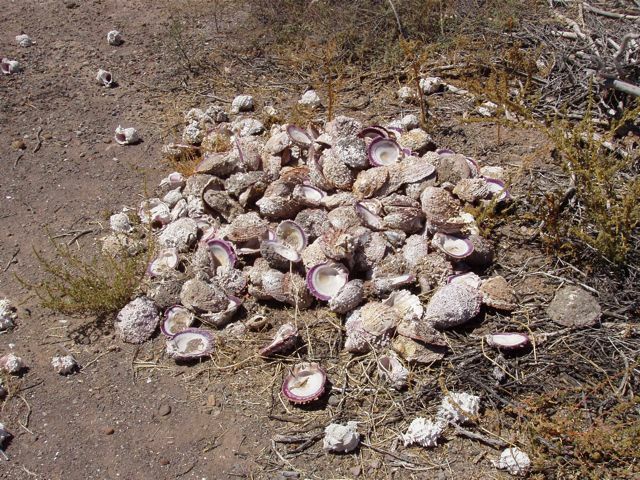 Mound of scallop shells attests to an appetite and a resource. Under the yellow sign is Estrella de Mar (Sea Star or Star of the Sea), a well-known institution. They open, when they open, between 3-10 PM, or thereabouts. Their famous dessert is jello and cream for 20 pesos. 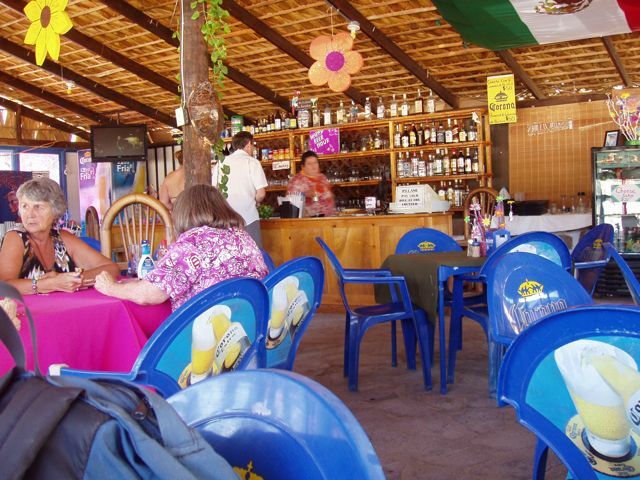 Bertha's Restaurant serves great and inexpensive food and is another well-known Baja restaurant. 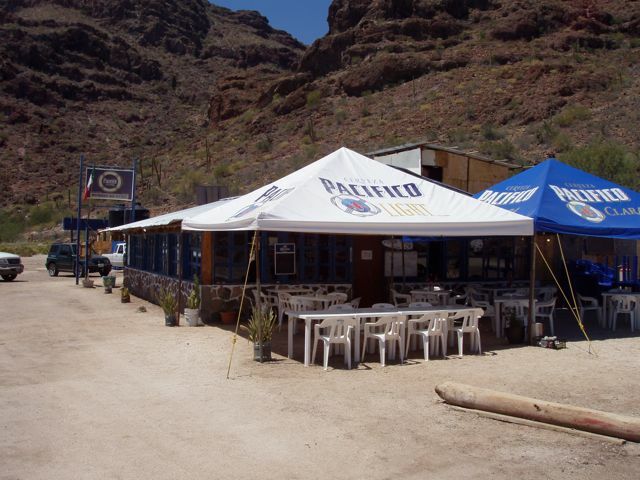 Three Pacificos, quesadilla with shrimp and shrimp tacos: US$15. Inside Bertha's, Bertha runs the place. There was a sizeable group of women playing cards (at left), while their husbands fished or drank: we never found out. All were American or Canadian and they spend winters down here in RVs. Hmmmm.....decisions, decisions. The beer helps. Only memories of home are allowed here. Lovely Conni gazes at lovely water. 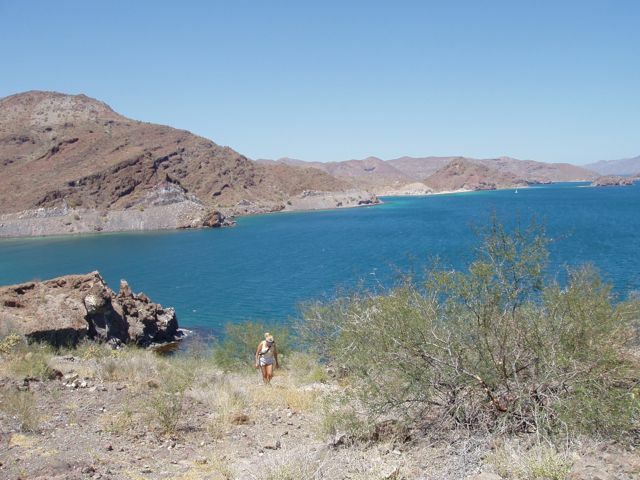 We climbed a small peninsula separating the two beaches of Playa Coyote (were Wings was) and Playa El Burro (where Bertha's was). Wings awaits us. The water was shallow! 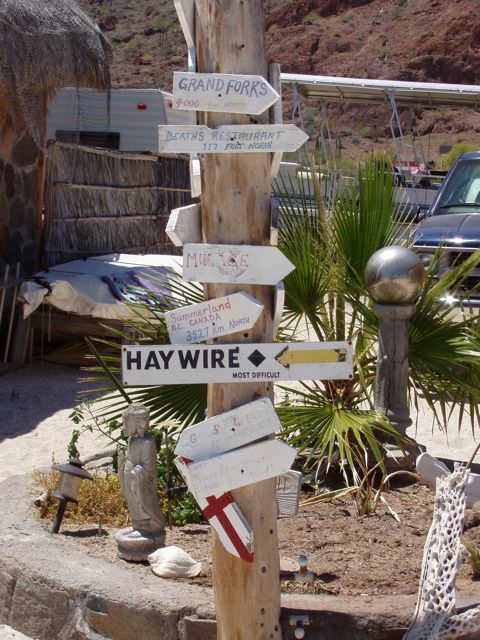 The small community of Rancho Coyote extends along the lovely beach. This is Playa El Burro. 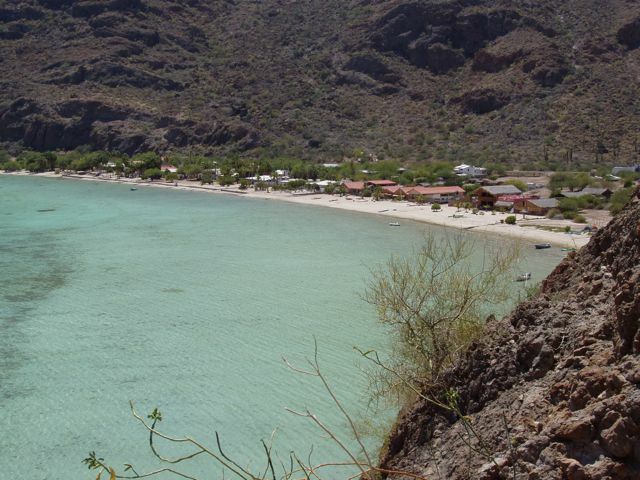 The small palapas along the beach are for rent and sale and some house small enterprises. 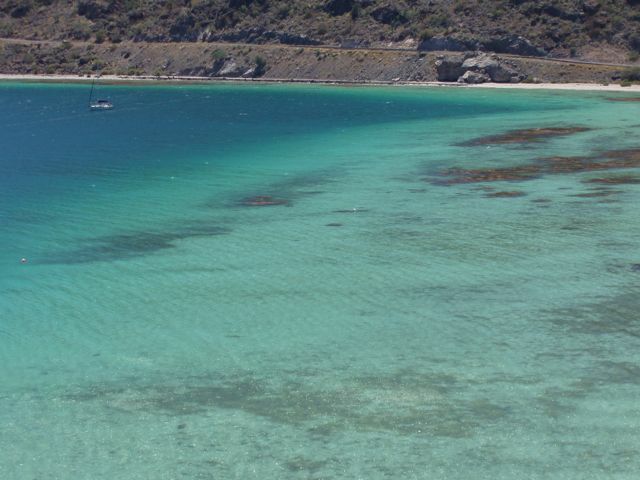 A kayak/boat rental business owns the small flotilla anchored close to the beach. Bertha's is on the far corner. The rock peninsula separates the two beaches and we hiked over it. 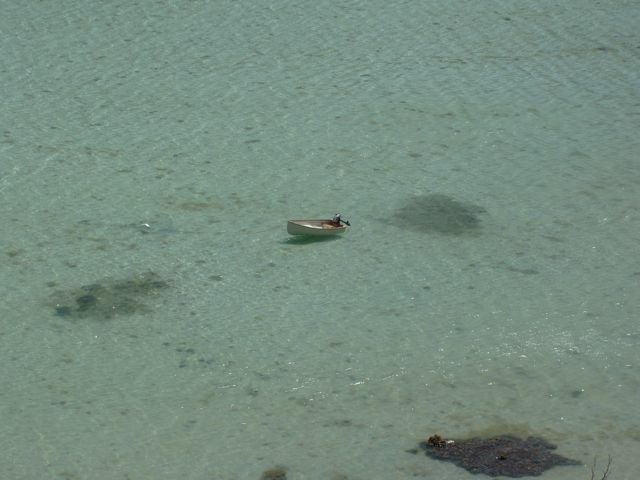 Floating in air, a small dink seems suspended in air as it rides in the clear water. Lovely Conni tops the peninsula separating the two beaches. It was quite windy as the white caps in the water below attest.